Long challenging the convention that a luxury car must be costly and difficult to attain, the Toyota Avalon takes a flagship position in the Japanese automaker’s sedan lineup, combining luxury, technology, styling and craftsmanship with c ore Toyota attributes like value, dependability, owner satisfaction, and long-term value. 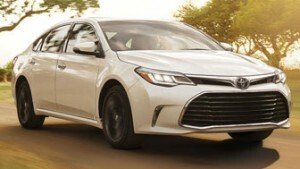 Backed by Toyota’s gleaming reputation for safety, sensibility and quality, the Avalon’s low price, high-luxury driving experience and generous tech offerings make it a compelling buy in a world-class luxury sedan without the world-class sticker price. And, for 2016, Toyota designers and engineers raise the bar with more refinement and style, enhanced features and technology, and improved performance. Translation? There has never been a better time to check out the Toyota Avalon. From outside, the 2016 Avalon boasts a more aggressive grille, lower stance, more dramatic sculpting, and more head-turning details than ever — including expanded use of LED lighting and revised use of chrome accenting. On board, a premium wood-grain dash trim package dials up the sophistication, while full-colour displays and new noise-reduction implements create an atmosphere that’s even more comfortable, modern and relaxed. Under the hood, Toyota’s proven 3.5-litre V6 spins up 268 horsepower, while driving modes including Normal, Sport and ECO tailor performance and output against the driver’s current intentions. A competent suspension system and precise, responsive electric power steering are backed by electronic handling enhancement systems, including Vehicle Stability Control, all tuned to strike an ideal balance between comfort, stability and agility. Further, all seating positions offer generous space in every direction, with notably generous rear-seat legroom and front-seat headroom. The Avalon’s generous trunk enables leading cargo capacity, with room to spare for the luggage of four or more adults, even for an extended voyage. But it’s the combination of honest pricing and leading feature content that arguably makes the Avalon such a sensible luxury car buy. Starting in the low forties, the Avalon Limited packs a standard 11-speaker JBL audio system, heated rear seats, a wireless Smartphone charging surface, a motorized rear window sunshade, triple-zone automatic climate control and automatic high-beams. That’s a standard equipment package full of features typically offered at extra-cost by competitive models, many of which come with a higher starting price. Further, the Avalon Limited is standard with Toyota Safety Sense — a networked array of hazard-detection systems which include pre-collision alert, lane departure alert, dynamic radar cruise control and more. These systems auto-activate whenever the vehicle is started, and work with your safe driving for maximum peace of mind through early alerts of potential hazards in the driving environment. The Avalon is also available in a generously equipped Touring model from $38,990, allowing drivers to step up into a full-size, full-featured touring sedan for a small premium over any number of fully-loaded midsized competitors. Included are features like push-button start, Bluetooth, automatic climate control, power seats, a moonroof, a full leather interior, and more.